Angry Birds Dream Blast is a match-2 puzzle game that lets you tap two or more bubbles of the same color to clear obstacles and complete certain objectives. The game boasts dreamy visuals and lots of fun levels. You will be addicted to it once you begin playing, thanks to its awesome graphics, simple gameplay and challenging levels. The game offers rewards to its players in a different manner. You will have to complete levels to earn XP. Once the XP bar fills up, you will get a gift box that contains gold and special boosters. You can also get a special reward once you complete a set of levels. Tapping 4 or more bubbles of the same color combines all of them and creates a bird power-up. Red Bird: Can be created when you match 4 or more bubbles of the same color. When tapped, the red bird power-up clears an entire row. The arrows on the left and right side of the bubble indicate that a row will be cleared. Tip: You will create a smaller power-up if you match only 4 bubbles. 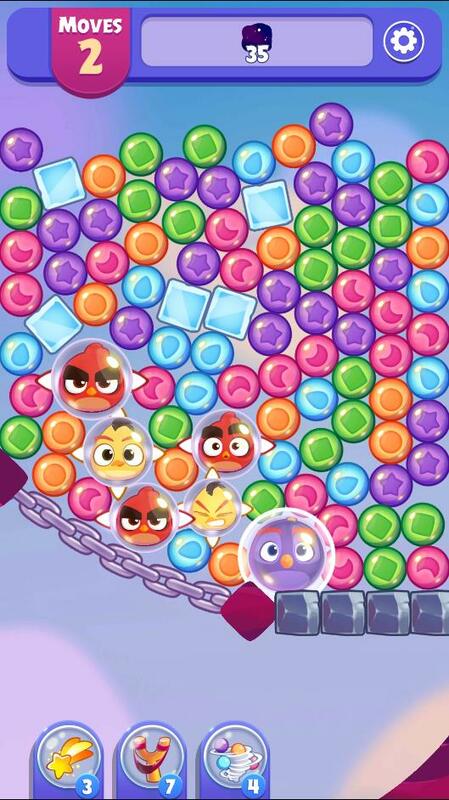 If you want to clear more rows at a time, tap a greater number of bubbles connected to each other to create a bigger red bird. Chuck’s Power-Up: Two red birds placed next to each other will be automatically combined to create Chuck. Tap Chuck to activate a cross-shaped blast that clears a row and column at the same time. You will be able to clear a greater number of bubbles in one move if you create a bigger Chuck. To do this, you will first need to create two bigger Red Birds and have them placed next to each other. Bomb’s Power-Up: The most devastating power-up of all three! Bomb clears all bubbles on the screen and can destroy any obstacle. You will need this power-up in later levels. Combine two Chucks to create a Bomb. Both Chucks should be placed next to each other. However, you cannot combine two bombs and I presume it’s the last power-up. It has more effect than any other power-ups in Angry Birds Dream Blast. In certain stages, you will be asked to get one or more than one egg to the bottom of the board. This might seem easy at first, but many such stages will comprise of multiple levels. You will have to make the eggs fall from the top to the bottom-most part of a stage and in-between you will face several obstacles like locks, cliffs, stone blocks, ice blocks etc. Break obstacles to reach the bottom as fast as possible. You should first make the eggs fall from one level to the other in very few moves. In egg levels, Chuck’s power-up can be of immense help as it can break obstacles. Thanks to his cross-shaped blast, Chuck can destroy obstacles that are lined up horizontally on a level. The Red bird can’t do this and so Chuck is the best option to break through ice cube and stone blocks to make way for eggs, so that they can reach the bottom of the board faster. You will have to remove a certain number of colored bubbles from the board to finish a level. The best way to clear them is to create several power-ups and then tap them to clear as many bubbles as you can in a single move. Since bubbles are placed randomly, it would be difficult to find and clear all of them. This is when power-ups come to play. You create the red bird power-up when you tap 4 or more same-colored bubbles placed next to each other. Tap it and it will clear bubbles in a row. Angry Birds Dream Blast has a unique match-3 concept. You will have to tap on a bubble linked to one or more bubbles of the same color to match them. When making a match, pay attention to the bubble you tap. Any power-up you intend to create will appear on the bubble you have tapped. For example: If you want to create the red bird power-up, you will need at least 4 bubbles of the same color placed next to each other. If you tap the middle bubble, then all four bubbles will combine and the red bird powerup will replace the middle bubble. If you tap the last bubble of the 4, Red will replace the last bubble you tapped. Knowing a bubble’s position is crucial if you want to place two red bird power-ups next to each other so that they can be combined into chuck’s power-up. You should also give importance to a bubble’s position if you want to break obstacles. There are various types of obstacles in this game. They can make things really difficult if you don’t know how to break them. 1. Ice Blocks: They are found in most levels. They act as barriers and you will have to break them to reach the end of a game board. While any set of same-colored bubble placed next to an ice block or a power-up can destroy them, using Chuck’s power-up can easily break through a bridge of ice blocks. 2. Stone Blocks: Can be destroyed using Red, Chuck and Bomb power-ups. You will find them acting as big obstacles. Only power-ups can break them. 3. Pig Locks: In some levels, you will have to open pig locks to break the chain so that you can reach the end of a level. The locks come in different colors and you will have to link bubbles with matching colors to open them. If a lock’s color is purple, then you will have to match purple bubbles placed next to each other to reduce the number. The lock will open when the number reduces to 0. 4. Pig Balloons: Pig balloons can only be popped using bird power-ups. Just make sure they are aligned with the birds. 5. Nightmare Cloud: This obstacle is part of an objective and you will have to remove a certain number of nightmare clouds to complete a level. You can easily remove them by tapping bubbles around them. But if you want to get rid of the nightmare cloud faster, use birds.